I have been focused on my weight from as long as I can remember, well into early childhood and it remains forefront on my mind. I am not a physician, nutritionist, psychologist nor dietician. I am someone with a food addiction who has successfully lost weight and has kept it off for most of my life. It has been my purpose to help others, even if that means just one person. Would you could you eat in a car? Would you after a night at the bar? Would you eat from stress after work? Would you eat instead of working out? Would you eat your son’s sandwich crust? Would you eat on a bus? Would you eat frosting off cupcakes? Would you eat after failed dates? Would you hide the food wrappers? Would you eat while listening to rappers? Would you eat when you celebrate? Would you lie about what you ate? Would you eat when depressed? Would you eat when undressed? Would you eat in a car? Would you eat from the jar? Would you eat from social anxiety? Would you eat a sundae instead of drinking tea? Would you eat peppermint bark, while in the dark? Would you eat in a park? Would you eat under a deck? Would you eat because… what the heck? Would you eat food still frozen? Would you eat scalding food from the oven? Would you eat from the carton? Would you eat the entire dozen? I would eat as I am. And I would eat them because I am. But I would try every day. I can do this! I would say. To focus on life instead of food. My father’s birthday is tomorrow, and he was my first inspiration for consistent exercise. He used to box in his college years and kept part of his training routine into his early seventies. This routine was done in the basement in front of the wood burning stove. He would put his t-shirt and shorts on followed by your basic gray sweat pants and gray hooded sweatshirt. Then he would add another layer that consisted of plastic gray pants and matching plastic gray top. We called it the “space suit”. This helped keep his body temperature in and burn extra calories. He finished off the ensemble with a thick heavy weight belt that went around his waist. He would turn on the television and jog in place, knees high up to his waist. Between the layers and the high temperature of the room from the fire he was soaked when he was finished. My father never referred to it as exercise. He never said, I’m going to work out. Never complained about it. It was just something he did after dinner and something that was part of our growing up. “Daddy’s in the basement jogging”. It was as rote as our address or phone number. I never thought about it as he was trying to stay in shape or lose weight, etc. But when I decided to make another effort to lose weight, I thought I would try jogging. I suited up like my father except for the “space suit” and weight belt. I did it after school before my father was home to build a fire so it wasn’t as hot. Our basement had four rooms that were all connected by doors. I opened all the doors so I could jog in a circle rather than in place. I didn’t think my knees would go that high if I jogged in place and that seemed like agony. The circle wasn’t perfect, there was a small bathroom in between rooms and the doors weren’t lined up. I had to do a little side stepping to keep going but I was able to continue my trek without stopping. I cranked up the record player and off I went. This was perfect for me! I loved music and I could jog to the beat and lose my thoughts into dreaming about how I would look thin, confident, and successful. The best part was no one could see me! It wasn’t pretty with all my mixed matched layers and huffing and puffing but it was successful. Nothing would stop me from my routine, even if I was out and didn’t get home until 9 o’clock at night, I was determined. I exercise at a gym now without caring if people see me. If they see me it’s because I am alive and determined. I wear a crumpled baseball cap, wrinkled tee shirt, sometimes a random bleach stain on my yoga pants, and sometimes my socks don’t match. It’s still not pretty but I still dream – new dreams. It doesn’t have to be pretty, it doesn’t have to be agony. Find something you like and build! I remember being in our dimly lit kitchen at night. I don’t recall my age, but I remember looking up at my father and seeing him bringing his arms up in the air. I mimicked this action with my own version of “jumping jacks”. I thought this was fun exercising with my father. When I was well into my adulthood my mother was talking about my father saying his prayers. My mother is protestant and my father is Greek Orthodox. She said that he was very elaborate with his praying ritual. He used to be a little embarrassed so he would go into the kitchen at night to pray in private. When she told us this story I was immediately brought back to my memory. It turns out my father wasn’t exercising, he was praying and lifting his arms up to God. I can only image how difficult it was to keep his composure with a toddler flaring about below. Whether you are praying or exercising, include your children. They will know it as being fun! Happy 86th Birthday Daddy!! Inspiring me still today! When I was laying out the format for the book version of “It’s Not About the Food” I was very clear and purposeful on what I would include and especially what I would NOT include. What you won’t see is a fat photo of me. It was a painful and shameful time for me. I share my personal stories and how I felt and that is enough exposure of myself to be comfortable. I don’t think showing anyone’s painful image is helpful. I want to keep a little of myself and my dignity intact. I cannot stand the show “The Biggest Loser”. It made me cringe to watch it. To parade these people with struggles on a public stage showing them at their worst I found humiliating and painful. Never mind displaying a giant screen with one’s weight posted! You won’t see me promote grueling exercise routines. If you dread it, you won’t do it. As I mentioned in the previous blog, take is slow and build. You do not have to do it perfectly, safely yes, perfectly not so much. I am aghast at again watching “The Biggest Loser” and these people being tested and yelled at (motivated? ), in order to burn fat. Certainly, I have days that I feel sluggish and I’m not motivated but I tell myself “I don’t HAVE to work out – I GET to work out”. I am healthy, I am alive, I can do this! You won’t see me show food or recipes. Anytime I have seen a photo of food, doesn’t matter how nutritious or low in calories, I want to eat. Period. Food = Craving. This is part of my addiction. If I ever publish the book version of this blog, the cover will be beautiful. I want people to find their happiness and I want it to start with holding a book that is beautiful and filled with pages of hope. What I hope to share is that you CAN succeed. I am living proof! I share my stories so that you will understand where I came from with my weight. The ups and downs and what were successful. It’s still a struggle today but I NEVER give up. NEVER GIVE UP! As with most school yards, the day is started with students lined up outside in front of their classroom doors. When I was in sixth grade that how ours started as well. I was walking with my younger sister to our doors. Hers came first (4th grade), before mine. As we were in front of hers, a boy in my class started yelling from the distance, “here comes the big fat elephant”, complete with the gesture of dangling his arm in front of himself to mimic an elephant trunk. He was first in the long line so that the rest of the class could hear. I could feel the presence of my little sister to my left and the presence felt like throbbing. I didn’t look at her to see her expression. I just continued walking toward my class and left her with hers. The throbbing feeling was embarrassment for my sister. I was used to ridicule but it was contained to my own little world. I never shared anything at home. It was if I lived a double life. In front of my family life was fine and I wasn’t casting shame on them. It was a surreal feeling to have my worlds collide. Tab Brown, the “mimicker” was all smiles and laughing. I thought perhaps he was just trying to joke with me because we sat next to other and were friendly. He had to be joking, right? We are friends, right? That’s all I remember from that event, feeling ashamed for my sister. I asked her recently and she doesn’t remember it at all. I doubt Tab Brown would remember either. I have come to realize that many times in a bully situation it isn’t about the “victim”. The “victim” did nothing wrong. The bully just wanted, or needed, to laugh that day. They wanted attention, they needed to let off steam from whatever it was they were going through. I was there. I was an easy target. If I saw Tab Brown today, I wouldn’t tell him. It makes no difference. He won’t remember because it didn’t impact his life. He got his release and attention and moved on. I moved on but I still remember. I still feel that throbbing to my side. But today I am here writing about my success through the pain of the past. And that’s pretty powerful! When Oprah Winfrey published her book “Making the Connection – Ten Steps to a Better Body and a Better Life” (1996) I had to read it. Oprah was, after all, was the most famous of weight loss success stories. She showed the world her weight loss success in 1988 and made that impactful moment by wheeling out a wagon loaded with the equivalency of her weight loss with cow fat. Of course, she gained back the weight prompting future attempts. I must admit I was glad that first attempt was not the solution. It was a liquid diet and I remember her speaking on her show to Gayle King’s husband (who turned her on to the program), that she would call him and justify why it was okay to eat one hardboiled egg. The thought of that torture was not something I wanted to embrace. Then, “Making the Connection” was published and again Oprah showed us her great success. I started reading the new book with the new solution. It was a rough start listening to Oprah’s struggles, her self-talk, her body image issues. I could relate to every single one of them and relived my own. I physically felt sharp pain from the hurt and sobbed through many paragraphs. I too had gone into the freezer and taken out frozen hot dog rolls and slathered jelly on them (still frozen) in desperation to satisfy a sweet tooth (or maybe that was just me – it was a very long time ago). However, Oprah lost me when she described waking up and motivating herself to meet her trainer for her early morning workouts. At that time, I had a toddler and new born and commuted an hour to work every day at a demanding job. I didn’t have an in-home gym. I didn’t have a personal trainer that could meet with me and motivate me. I didn’t have the disposable income to invest in anything that would assist me to get to a healthy weight. I expected to read about how Diana McLean could succeed. I resented Oprah and I can remember yelling out loud “For God’s sake woman you’re a millionaire pay someone to take food out of your mouth”!!!! How would anything Oprah say motivate me? Her lifestyle is so far removed from mine. But I did buy the book, read the book and shared her hurt so there had to be some take away for me. I did experience a moment of enthusiasm and determination and went for a long walk up and down hills and was proud of myself. That lasted a day because I was sore for several days later and that wiped out the desire to continue. Shortly thereafter my husband took a job change and I was able to stay home with the children. Being a stay-at-home Mom doesn’t mean you acquire a vacation pass. When being a Mom there is still a schedule to follow but your activities switch from reading reports to reading “Brown Bear” and strategic planning to strategic ways to show how to share toys. I got to the point where I needed to get some type of organized physical activity into my life, for just me. I started with five (5) minutes. Everyone has 5 minutes in their day to put aside for exercise and that’s what I did. So, I began my morning exercise routine that I have consistently continued until present day. I did a 5-minute exercise video that I considered fun. I knew I could do more, but I wanted to look forward to it every day. I didn’t want it to be so stressful and painful that I would be too sore the next day or dread doing it. When I mastered the 5, I kept increasing. I eventually got to an hour and continue to exercise for an hour every morning. It’s part of my day as if it were brushing my teeth. Throughout the years the routine has changed from walking, running, workout videos, and the elliptical. But I continue to move. Exercise for 5 minutes when you are most likely to have time to increase that time. For me, I can never fit an hour into a lunch time and evenings are unpredictable for me. My routine is in the morning. Nonetheless, my advice to everyone – start with 5 minutes! You have 5 minutes during your day to do something and that something should be an investment in YOU! P.S. Regardless of my once resentment, I do love Oprah and I needed her story to make me feel that others, regardless of wealth or stature, share my struggles. 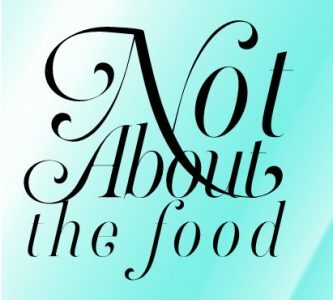 The entire premise of “It’s Not About the Food” is to live your life and occupy your thoughts on living and not your next meal. Below I am sharing with you some suggestions to keep your mind off of eating. Do not pull out this list, put it on the fridge and start checking things off the list. This list is to demonstrate the infinite possibilities and options rather than eating. They are opportunities to enjoy the moments in your life and sustain your existence. When I first drafted this list is was when I was writing the book version of the blog. It was so long ago that Facebook and many social media sites were not as popular as they are today. There are also many incredible books that I have read since I started writing. I have added a couple to the list, but I really could share so many!! One thought to share with you about the book list – never feel overwhelmed that you have to read any book cover-to-cover. Many times, I’ll start reading and something profound will grab me and can be life changing. Then I’ll find the rest of the book doesn’t keep my interest and I’m content with stopping and moving on. If you’ve ever read “The Art of War” you’ll know what I mean. Not all things on this list are in the entertainment or leisure categories. There are basic housekeeping and grooming items as well. It’s good to be organized in your life as it gives you control and empowers you. When you gain control of one aspect of your life it spills over the other areas. There will always be unexpected turns or glitches in life but when in control you will be poised to handle them. As I mentioned these are suggestions and I’m sure you could write your own list of not just 101 but 1001 and then some. Keep adding to the list and keep living a joyful life! Give yourself a pedicure, soak your feet, etc. Organize greeting cards so you’ll be ready for birthdays, etc. Eastern Orthodox Lent started this past Monday and reminded me of the first time I had success with weight loss. I won’t call it a “diet” because I don’t think that was the intention. I was twelve and decided to give “everything” up for lent. This included sweets, pizza, sugar, butter, and gravy, etc. Being a God-fearing young girl, I was very disciplined. I can remember sitting in front of people who were eating pizza and I was very matter of fact about not eating anything. It was as if there was an invisible barrier keeping me from eating anything I had given up. Easter had arrived and I was still reluctant to eating anything on the “bad” list. People had noticed I had lost weight and were very complimentary. At this time, I had also started exercising. I really didn’t know what I was doing, it was deep-knee bends and sit-ups, the basic calisthenics. More weight came off and more compliments were received. I was obsessed with making sure I never gained weight again! My obsession led to exercising two hours each day and eating as little food as possible. I would measure out every ounce of found and lived with my calorie counting book. I was so proud when I could get down to eating only 250 calories a day. People would tell me I was getting too thin, but I thought they were jealous and trying to sabotage me. Eventually I had no energy and would just lie in bed crying wondering what was wrong. My hair started thinning and my nails were brittle. Somehow, I snapped out of the obsession of not eating and started bingeing on the weekends. I remember eating a bunch of donuts one Saturday that kicked off the cycle. I can see still see the box in front of me and not being able to control myself. The once a week bingeing started to be more than once a week. I eventually put all my weight back on and then some (and some more…). I have tried other years to be disciplined during Lent but never really had the success of that time in my life. I start off strong and then gradually fall off each week. Usually by the last week my commitment is “I won’t eat chocolate chip cookies on Thursday”. As Lent has arrived this year, I have decided to make the commitment to give up sweets. This time it’s not about losing weight. I am at peace for the most part of where I am. This time it’s about reflecting that God has been with me the entire journey. When so much around us in the world is out of our control, my faith in God has been my constant. May God Bless you on your journey! Many times, I would run into someone who I had not seen in a while and they had managed to lose weight and look fabulous. My first reaction is sadness, disappointment, and ultimately jealousy. I would think how could they have done it and I not? They are the better person than I because they were strong, and I am a loser that I could not control my eating. Then I got to a place where I thought they were in my life for a reason. Perhaps they will inspire me – maybe out of jealously or shame or just to surround myself with others who knew what to do. I came to a point where I stopped looking at those people who were successful as the “enemy” and instead welcomed them into my world as a source of inspiration. Having lost weight, they obviously knew where I have been or am. They know about the challenges of overeating and were able to overcome the behavior and learn to lose the weight. My feelings were not all negative. I think it was mostly towards people who lost weight who I believed didn’t need to lose weight in the first place. If I knew of someone who truly struggled as I did, I could be genuinely happy for them. They found the strength within themselves to break through the “wall” and lose weight. You can find inspiration to get you motivated in many different places. Watching infomercials about exercise equipment or weight loss to feel healthy and get into a healthy mindset. Surround yourself with people who have a healthy mindset and like to be active. You can draw strength from people around you that have lost weight or have always been healthy. You can be inspired by others who have faced challenges in their lives other than battling weight. Inspiration can come from people who have overcome obstacles in their life other than losing weight. You can adopt the same principles that people use to overcome any kind of challenge whether it be physical, emotional, mental, or even financial. What was the common thread that helped them to succeed? Read their stories to find the answer. I would be willing to speculate that they started with a goal, had a plan and worked to stay positive and focused on that plan. Again, read their stories and talk to these people, be uplifted from them and be inspired. Something unexpected has happened to me by sharing my stories from my past. The hurt and pain has bubbled up to the surface. I didn’t think much of it until something recently happened to me that put me over the edge emotionally. Something seemingly insignificant was magnified in my emotional psyche and I lost it (didn’t want to say “lost my cookies” because that would never happen!). I’m not going to go into detail, but I found myself back in fourth grade feeling embarrassed of myself. That said, I recognized what was going on in my mind and compartmentalized fourth grade and now. What I understand now is that I can only control my self-talk and my actions and own only that. I have no idea what others are thinking and what is going on in their life and it would be silly to assume otherwise. People are good. I am good, and I will continue to share.